The top two teams in the Eastern Conference met last night. You may have missed it: first of all, the men’s Final Four was last night; second of all, you might’ve simply sagged into the position, literally weeks ago, that the top of the Eastern Conference was settled. It’s not! The Celtics came into Saturday night behind the Raptors by three games, which would make catching them before the season ends in 10 days unlikely, but not quite impossible. A lot would have to go Boston’s way, but the games are still being played. That’s not the only reason the East might’ve felt settled. The Celtics are still without Kyrie Irving, and will be for at least the remainder of the regular season; they’re also without Marcus Smart, whose hand injury is still healing; they are also without useful rotation big man Daniel Theis, whose season is over. For that matter, Saturday night they were also without Shane Larkin, who has averaged about 24 minutes a game in March while the Celtics are down a point guard. The Celtics are virtually unrecognizable, and anyone could be forgiven for seeing the state of their roster and just kind of feeling like the part of the season when they could meaningfully challenge for the top of the conference was over. You wouldn’t expect the Celtics to put 110 on the board against a tough defensive team in a game in which Jaylen Brown scored just four points on eight shots in 30 minutes, but these plucky Celtics find a way. Jayson Tatum had 24 points on 16 shots; Terry Rozier added 21 points on 17 shots, plus seven assists; Marcus Morris, in heavy use off the bench, had 25 points in 35 minutes. It’s important to remember that even the “full strength” Celtics of a few weeks ago weren’t at actual full strength, and they won’t be until next season, when Gordon Hayward returns. Last night Brad Stevens gave meaningful minutes to Semi Ojeleye, Kadeem Allen, Greg Monroe, and Abdel Nader. This isn’t necessarily to knock any of those fine gentlemen, but that’s not even close to the rotation Danny Ainge envisioned when he assembled this team. The Celtics would be running out a starting lineup that features Kyrie Irving, Gordon Hayward, Al Horford, and at least one of the Tatum-Brown combo, if not both. Smart, Rozier, and Morris would be anchoring the bench, with some minutes in there for Theis. Ojeleye, Allen, and Nader would be watching from the bench. Greg Monroe probably wouldn’t even be on the team. It’s wild to think of depth powering an Eastern Conference team over the Raptors, whose bench excellence practically defines their ascendency, but here we are: Boston’s fill-in starters and emergency subs held the conference’s best offense to 99 points, the fewest points the Raptors have scored in a loss since, my God, January 26. And whereas, say, the Wizards survived John Wall’s absence by continuing to get excellent play from a heavy-use starting lineup, the Celtics beat the Raptors Saturday night behind unlikely-as-hell bench lineups: Boston’s starting lineup (Rozier, Brown, Tatum, Horford, Aron Baynes) finished minus-seven in 11 minutes of burn; a lineup that swapped Morris in for Baynes finished plus-12 in eight minutes; Brad Stevens’s third-most used lineup featured Allen, Ojeleye, and Monroe, and finished plus-two; the fourth-most used lineup featured Abdel Nader, and finished plus-six. All of which is to say that Brad Stevens is a goddamn magician. Every time the Raptors looked like they were ready to gain some distance on the Celtics, some Celtics role player would make a play and get a bucket. With the Raptors up five in the third quarter and the shot clock winding down, Tatum fought through contact in the paint and dropped the ball off to Morris for an and-one layup; with the Raptors again up five after a Serge Ibaka three-pointer, Rozier pushed the ball in semi-transition, drew an extra defender, then swung the ball back towards the top of the key, where it soon found its way to a wide open Tatum, who knocked down the three; after a Raptors free throw, Marcus Morris got away with an incredible travel before banking in an and-one up-and-under from the elbow (seriously, this travel was really something, and you can watch it in all its glory at the 6:19 mark of the video above). Toronto had the lead for most of the first three quarters, but could never extend it beyond six points. The Celtics always had an answer. Operating without some of his best players has forced Brad Stevens to put some trust in and afford some opportunities to certain players and player combinations that would not otherwise be playing in an important game against the top seed in the conference, but Stevens has a freakish, uncanny ability to pull all the right strings, going so far as to deploy a zone defense to frustrate the Raptors Saturday night. The shorthanded Celtics have now won six straight games, including games against the Blazers, the Jazz, the Thunder, and now the Raptors. Who knows whether all this bench production will pay dividends later this year, when the Celtics are in the playoffs. 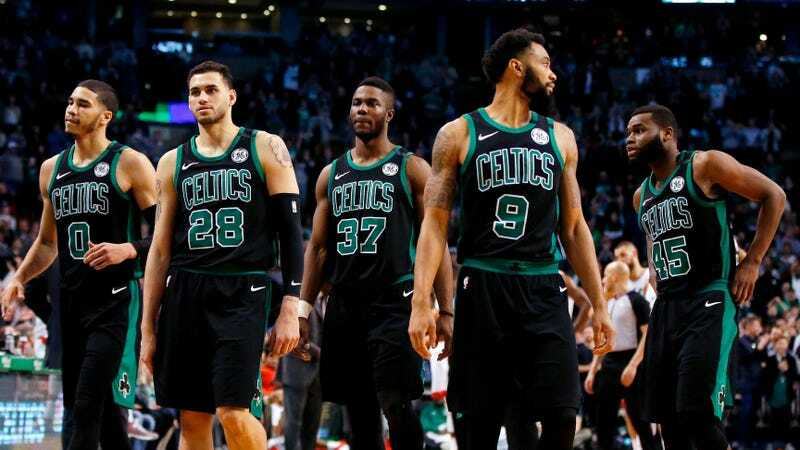 They may never be healthy enough to show what even the Hayward-less team can do at what I guess we will call full strength, but we have for sure learned that they don’t have to be anywhere close to full strength to put up a hell of a fight.